It’s interesting to hear that the digital team at the Ministry of Justice have developed a new staff directory. I know a few departments are already opting to use this service and it will be interesting to follow progress. The staff directory was a big problem at the Ministry when I worked there. People used a combination of looking someone up in Outlook, or resorting to the internal staff directory, originally developed by the IT department. The problem with looking someone up in Outlook is that you had to know the name of the person. The Outlook directory was notorious for being out of date as there was no integration between IT and Human Resources systems. The internal staff directory at MoJ was similarly useless. Staff who left years ago were still present. And although people moaned that they could never find anyone in the directory, they didn’t bother updating their own details either. At one point we had a big push on getting the directory up to date, with adverts on the intranet, and a serious clearout of data as control of the directory moved to Communications and sat with the Public Enquiry Line team, who made most use of the directory while taking incoming calls and connecting the public to people within the Ministry. Although it was possible to update your own record in the staff directory, it required a separate login, which involved the inevitable arduous forgotten password routine and setting a new password with stupidly harsh naming restrictions leaving no chance of remembering it again. The staff directory wasn’t integrated with your login to the network or with your HR Shared Services account or with the intranet. It’s good to hear that the new people finder won’t require a login. From what I’ve heard, MoJ are planning to allow open access to all profiles, which raises different kinds of data quality issues. 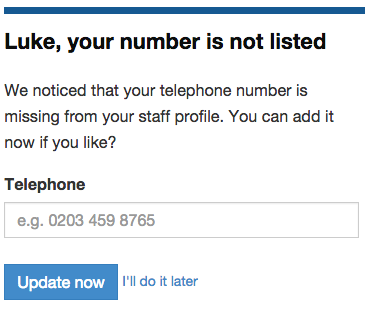 I remember thinking, when I worked at MoJ, that the key to keeping the staff directory up to date would be to allow staff to have their own rich profiles on the intranet which they can update with more than just a phone number and job title. Make the people real, with personal interests, hobbies, skills and job history. All searchable. I wrote a business case to integrate our Google Search Appliance (used on the intranet) with plans for an extended staff directory, which would have allowed people to search the staff database, with Google intelligence, direct from the intranet. ITC and external suppliers wanted around £60K to do this (presumably write a few lines of code to allow the internal Google box to talk to the internal staff directory database). So it didn’t happen. I’m glad those days are over and that developers can create their own systems unrestricted. I took a lot of this experience to the table when I developed the staff directory with DCMS. We’ve integrated the staff directory so that everyone has a WordPress account on the intranet and their own staff profile. They can post in forums, write blog posts, vote in polls, comment on stories, collaborate in wikis and update their own profiles (but not each others’). Incidentally, none of my clients call it a social intranet. In fact, they don’t call it anything but “the intranet,” even after staff naming competitions. Staff profile avatars and links appear around the intranet in comments, forum posts, page footers, blog posts, search results and in the actual staff directory. You can search for people from the main intranet search box (without having to tick a special box), or from the staff directory pages on the intranet (not an external system). You can search for names of people, teams, skills and telephone numbers. Handy if you’re looking for someone who speaks Spanish, or maybe someone who can create a video, but you don’t know their name or department. We also have a “Profile nudge” widget which reminds staff to update elements of their profile if anything is missing. Intranet administrators can configure which elements to nag about and whereabouts on the intranet the widget should appear. Staff can update their details straight away without disrupting what they were doing. This integration increases the chances of keeping the information up to date and makes the intranet alive with real people woven around the content. See a blog post from a senior staff member, with an associated avatar and staff profile. 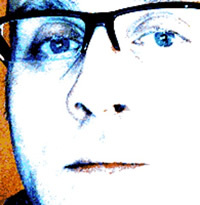 Read a forum post from the organiser of the staff choir, with an associated avatar and staff profile. Check out the new joiner in the comms team. A network of connected user profiles and intranet content means that we can create a social graph. While we are nowhere near this with GovIntranet, the potential is there. When we have data about our staff, their browsing habits, their likes and dislikes, we can produce targeted content. We can anticipate their moves, offering information when they need it, where they need it. My first stab at tapping into this is the new “Intraverts” widget, released as part of version 4 of the GovIntranet WordPress theme. The plugin integrates with the staff directory giving a targeted messaging system across the intranet. So instead of the blanket campaign messages from internal comms that appear on the homepage regardless of who you are, the widget allows you to target groups of staff, on specific sections of the intranet over specific time periods. If you want to get a message out about flu jabs or giving blood, you could place an advert on all pages in the health and wellbeing section of the intranet, where staff are likely to be browsing related content. How about targeting just Band A managers on the homepage with updates about forthcoming performance reviews? Or if Band C staff are logged on we could remind them about a forthcoming series of Freedom of Information training seminars that they’ll be required to attend. 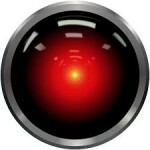 The staff directory across our GovIntranet clients is being used, although are all system security staff trained to add a photo of HAL as their avatar??? The DCMS comms team page is a bit different, as all staff in the team have posed for photos in Brady Bunch fashion, so their staff directory entries show them looking up and down and across at each other! The British Business Bank are racing ahead though in the league of GovIntranet clients, with the largest proportion of staff profiles voluntarily completed with avatars. I wonder if the new MoJ directory will ever achieve this, and if there are plans to integrate with some form of social profile on the new MoJ intranet? While it will be a great resource if everyone in the Civil Service used it, would it be maintained and kept up to date? If anyone can edit profiles, will it get abused? Will it get used? Or will it be another Civil Pages?